Three journalists working for the Al-Jazeera English television network have been remanded in custody for 15 days by the Egyptian authorities. A statement from the public prosecutor in Cairo said the men were accused of joining an illegal terrorist group, supplying that group with equipment, and three other charges. The three include Peter Greste – an Australian former BBC journalist. A cameraman who was also arrested has since been released. Al Anstey, director of Al-Jazeera English, said the detentions were “outrageous” and the accusations against the men “totally false and unfounded”. Egyptian authorities have accused Al-Jazeera of bias in favour of the Muslim Brotherhood since the army overthrew President Mohammed Morsi in July. The Brotherhood was declared a terrorist organisation last week, amid a crackdown on the group in which hundreds of pro-Morsi protesters have been killed and thousands of Brotherhood supporters arrested. 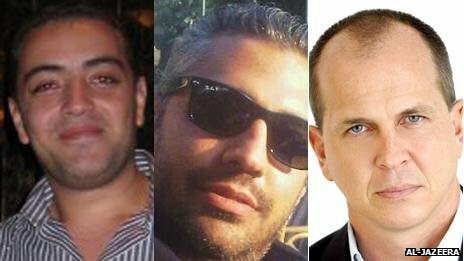 The four journalists were arrested on Sunday – some at their makeshift office at the five-star Marriott Hotel in Cairo. Cameraman Mohamed Fawzy was released on Tuesday but the remaining three have been remanded in custody for 15 days by the public prosecutor. That detention can be extended if formal charges are brought. As well as Mr Greste, they are Mohamed Fadel Fahmy, who holds Canadian nationality and producer Baher Mohamed. As well as belonging to an illegal terrorist group – the Brotherhood – and helping promote its objectives, the detainees are accused by prosecutors of broadcasting “false news… that undermines the national interest and public security and spreads fear among the people” and possessing broadcasting equipment without a licence. Al-Jazeera says its “hugely experienced” journalists were working legally on a variety of stories, and demanded their immediate release along with their belongings and equipment. It says two of its other staff – journalist Abdullah al-Shami and cameraman Mohamed Badr – have been held without charge for over five months.